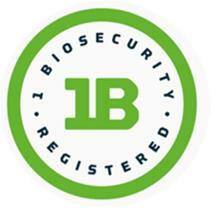 Who can register for a One Biosecurity account? Cattle and sheep producers with an active South Australian Property Identification Code (PIC) can create a One Biosecurity account. Access to the One Biosecurity system will be automatically granted to PIC holders, presuming the PIC is current and registered to the person applying for the account. Livestock agents, saleyard operators and abattoirs/buyers can also request access to the system – these applications are manually assessed, and therefore access is not immediate. Please contact your local Animal Health Officer to register your interest (click here for the contact details). How do I register for a One Biosecurity producer account? To register for a One Biosecurity account, you need to first register with myPIRSA. You must register under the same name as for your PIC(s). Once you have completed the myPIRSA registration you will be sent an email link to validate your account. You do not need to log in to myPIRSA to access One Biosecurity. Once you have a myPIRSA account, you can just use the same login details to access One Biosecurity directly, via the LOGIN button on the top right hand corner of this page, and follow the instructions (note that the One Biosecurity login page looks the same as the myPIRSA login page). To troubleshoot any issues with creating a myPIRSA account, click here. How do I register for a One Biosecurity agent/saleyard/abattoir account? Allied businesses – such as livestock agents, buyers and processors – can apply for One Biosecurity registration. They can apply by contacting their local Animal Health Officer. Livestock agents and other allied personnel applications for access to One Biosecurity will be processed through the Animal Health Officer for the area. This will involve a face-to-face discussion during which the operations of the program, the biosecurity star rating and disease risk ratings are explained. They will also be expected to know the key regulatory requirements of the program to enable them to correctly advise their clients. Please click here for the contact details of your local Animal Health Officers. What if I already have a myPIRSA account? If you already have a myPIRSA account, you can use the same login details to login to One Biosecurity and create an account. In order to complete your producer registration with One Biosecurity you must have an active South Australian Property Identification Code (PIC) for sheep or cattle registered in the same name as your myPIRSA account. To use your existing myPIRSA account to login and create a One Biosecurity account, click the LOGIN button in the top right hand corner of this page, and follow the instructions. I have multiple South Australian Property Identification Codes (PICs). Do I need to have a separate account for each of my PICs? No. You can register all of your active South Australian PICs within the same One Biosecurity account. Please note that if one of your PICs expires, your One Biosecurity account access to that particular PIC will be automatically suspended until you have renewed your PIC registration. I have a farm manager. Can they access my One Biosecurity producer account? Anyone who is registered on the same PIC can create a separate One Biosecurity account and access the information relevant to that PIC. For example, if you have a farm manager (who is registered on your PIC) they can complete all the One Biosecurity details for your enterprise and with your account you can view (and edit, if required) the same information. What is a One Biosecurity enterprise? You can create as many enterprises as is relevant for your business, but each one must be recorded against the appropriate PIC. The PIC must be current and the species of livestock you select must be registered against that PIC. How do I add an enterprise to my profile? Once you have registered for a One Biosecurity account and added your PIC to your profile, click ‘Add Enterprise’ and follow the step-by-step instructions. You will need to select the species of livestock you wish to create an enterprise for and then enter your PIC. Once the system has validated that the species selected is registered against that PIC, you can go on to select and describe the characteristics of your enterprise. The system will step you through the items you need to enter.